One of the things patients often comment on when they arrive for their first visit to DermEffects is our location inside a renovated historic church. It certainly is unique among dermatologists in London, Ontario. Dr. Wei Jing Loo used her eye for aesthetics to create a space in which patients feel comfortable throughout their experiences at our practice. While the location is steeped in history, Dr. Loo offers modern, technologically advanced equipment and effective, clinically proven treatments for both medical and cosmetic dermatology patients, including a range of lasers treatments designed for specific skin conditions. Dr. Loo’s personality and passion for art and providing advanced dermatology treatments — including a range of laser systems — is seen throughout the office. Her watercolours featuring poppies create a soothing environment for patients and staff alike. Dr. Loo’s renovation of Hyde Park United Church also included incorporating green energy whenever possible, including a new energy-efficient heating system. Reclaimed church pews offer patient seating in the waiting room, which features a black, grey, and red color scheme that complements Dr. Loo’s paintings. 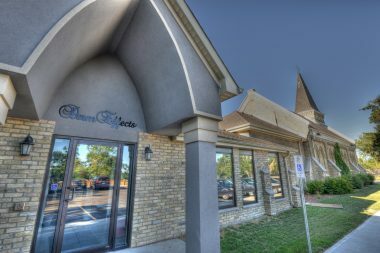 DermEffects is housed in the yellow brick church with a tall steeple on the southwest corner where Hyde Park and Gainsborough roads intersect. Please turn right into the car park if driving south on Hyde Park Road. If you are driving north on Hyde Park Road, please turn left onto Gainsborough Road and then make an immediate left turn into a small lane, just after the entrance to the corner strip mall (where Featherfields is located). If you’re looking in the London area for a cosmetic dermatologist, request a consultation with Dr. Loo using the online form, or call our office at (519) 472-8686 to schedule an appointment.